A retired California schoolteacher and her cocker spaniel help solve several murders. Along with her dog, Millie, Mary McGill is very active in Santa Louisa’s community affairs. So, naturally, she arrives early at St. Mark’s community center to help set up for a rummage sale. She’s disturbed to find the door open and more than disturbed to find the body of Miss Emilie Plym inside. Because Mary’s niece, Ellen, is married to Police Chief Dan Dunham, Mary is privy to inside information and is no stranger to murder (Purebred Dead, 2015). Miss Plym lived alone in a mansion on several large lots in town, supported, like her recently deceased sister, by money from a trust fund. Despite the help she had from Lorraine and Caleb Duxworth, who lived over the garage on her property, Miss Plym had lately become a little vague, and her nephew, Richard, and niece, Cassandra, had recently arrived in town with the idea of putting her in a nursing home. 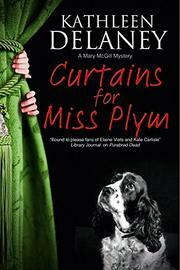 As Dan investigates and Mary trawls for gossip all over town, they discover that Miss Plym had been withdrawing large sums of money from her trust fund account, money that’s now vanished. When Miss Plym’s snoopy former home care nurse is also murdered, Dan and Mary realize the missing funds are the key. Mary’s hunch about where it may be sets up an encounter with the murderer. Mary and Millie are such engaging characters that the time spent with them makes up for some of the weaknesses in this pleasant cozy.